May 16, 2017 / David Morrow / Comments Off on Ericsson Bribery & Corruption – too little, too late? When I first encountered the telecoms industry in 1994, it seemed like every bit of kit was made by either Ericsson or Nokia and the whole mobile industry revolved around Scandinavia. Ericsson was everywhere and supplied everything; it was a boom time for mobile. The first public allegations against Ericsson surface in 2000, when the press reported an Italian businessman’s claims that he was the front man for Ericsson’s payments in the United Arab Emirates. In 2002, a Swedish prosecutor starts a related investigation into tax evasion and in 2004, the prosecutor is contacted by Swiss Authorities regarding suspicious Ericsson transactions reported by UBS Switzerland. In 2005, seven people linked to Ericsson are indicted for tax evasion but all are acquitted. What’s your reaction – ‘no smoke without fire’? You’re not alone; that’s a lot of smoke. I was disappointed and annoyed that a major industry player had allowed this situation to occur. Why hadn’t they done something about it? I began to run through the things they should have done and I wondered why they hadn’t prevented or detected the alleged bribery. So I decided to find out. Why is there an asterisk against ‘Yes’ items in the ‘Evidence’ column? These are allegations that have progressed to legal proceedings so I’m assuming that evidence was submitted as part of the process but, for the most part, the evidence and testimony from those proceedings isn’t publicly available. What can you see through the smoke? In 2000, Italian businessman Federico Marcellusi told the Swedish newspaper Expressen that he transferred more than USD 7 million to a secret bank account in Abu Dhabi on behalf of Ericsson. Marcellusi had been engaged as a middleman in 1998 and 1999 but the arrangement ended in disagreement and Marcellusi prepared legal action against Ericsson because he claimed it had destroyed his reputation. The allegations grabbed the attention of Sweden’s tax authorities and in 2001 they found 33 more companies which had been transferring money on behalf of Ericsson, resulting in the payment of a further USD 88 million in taxes. In 2005, seven people linked to Ericsson are indicted for tax evasion relating to USD 374 million of allegedly false invoices used to hide other payments, but the Italian businessman doesn’t show up to the 2006 trial in Stockholm District Court and the accused are acquitted. This little pearl surfaced during a legal dispute between Ericsson and Thomas Lundin, the former CEO of Ericsson Romania, who worked for Ericsson from 1979 to 2003; some of the documents are available online. The case papers say that Ericsson set up the World Commission System (WCS), a network of offshore companies, as a means of making payments to agents and intermediaries on its behalf. This extra layer between Ericsson and its agents was said to prevent disclosure of Ericsson’s agents and protect their anonymity. The intermediary companies charged one percent of the total amount Ericsson transferred to its agent. An Ericsson internal audit in 2000 discovered irregularities, leading to WCS being shut down. Ericsson immediately signed a new contract with a newly incorporated Cypriot company, TelworldAG Consulting & Marketing Ltd, to act as Ericsson’s agent for the Romanian market. Sveriges Radio broke the story of former employee Liss Olof Nenzell during April 2014. It was reported that Nenzell handled many of Ericsson’s trade agents at the time, and that Ericsson paid over 10 million Euros (USD 11mn) to an agent in connection with the sale of Ericsson’s military radar system Erieye, a ten-year deal worth over 400 million Euros (USD 440mn) in total. This was an important order for Ericsson as Greece was the first NATO member to buy the system. Nenzell claims the money was paid to politicians, generals and senior civil servants. Swedish Radio News reported that they had obtained secret internal documents from Ericsson, including two payment orders for USD 13.8 million from January 2000. The documents had been signed by two senior managers at Ericsson. Sveriges Radio also reported that Antonis Kantas, a senior manager at the Department of Defence, had admitted to receiving more than USD 15 million in bribes from big corporations in relation to arms contracts, including a bribe from Ericsson’s agent in Greece. In June 2016, an Ericsson press release disclosed that Greek authorities were investigating a 1999 agreement in which Ericsson Microwave Systems delivered an airborne radar system to Greece. Ericsson Microwave Systems was sold by Ericsson in 2006. In March 2017, a council of Greek Appeal Court judges received the 363-page prosecutor’s recommendation that 17 accused should stand trial for bribes paid to officials in connection to the purchase of defence equipment, including the Ericsson flight radar. Ericsson didn’t say whether US enquiries included China. In contrast, SvD was more forthcoming on the issue. They stated that the SEC-led enquiry related to a recently fired senior manager’s interests in a subcontractor company with a virtual monopoly on delivering to Ericsson in China. SvD reported that Ericsson’s former CEO Carl-Henric Svanberg had been informed of the suspected corruption a decade earlier. An internal investigation was initiated, but the consequence was that the whistle-blower was fired by a senior manager who was also fired later on. When I saw the press coverage of Ericsson bribery allegations in November 2016, I was disappointed that a major industry player had allowed this situation to occur. I wanted to understand why they hadn’t done something about it, and I decided to find out. Also in 2000, an internal auditor for Ericsson conducted an audit of the WCS structure and discovered irregularities related to the payment system coordinated by Nenzell. Subsequently, UBS Switzerland suspected money laundering and filed a report which started a Swiss investigation. The Swiss investigators allowed Ericsson access to the suspect bank accounts. In 2005-2006, the company finally understood the amounts diverted from the agents’ accounts. Consequently, Ericsson accused Nenzell, Thomas Lundin and Antoniu Petrescu, (CEO and Deputy of Ericsson Romania) of abusing WCS payment processes and siphoning off USD 23 million into offshore accounts which they controlled. In 2012, the press reported that Nenzell contacted the SEC as a whistle-blower claiming that Ericsson has paid hundreds of millions in bribes. Nenzell describes how, on one occasion, a large sum got stuck in a bank in Monaco and he travelled to Monaco together with an Ericsson director to help get it released. Details of this incident are included in the Greek prosecution recommendation submitted in March 2017. That recommendation names 17 people who should stand trial for bribes paid to officials. It names the Ericsson director but doesn’t include Nenzell. If you thought the practices were illegal why didn’t you leave the business? Why was destroying documents illegal but paying bribes was OK? Why didn’t you take this information to the authorities when you left Ericsson 15 years ago? Why aren’t you being prosecuted in Greece? Are you claiming a whistle-blower reward in USA? So, we’ve heard from the whistle-blower, but what does Ericsson have to say for itself? From 2000 onwards, Ericsson has periodically been asked to comment on bribery allegations. Examples follow. Q: Have you bribed Romanian politicians in order to get the 112 contract? 2013 – Fredrik Hallstan is quoted by the Organised Crime and Corruption Reporting Project (OCCRP) saying the company has never paid bribes. Q: When you have taken in the facts that we have talked about, what is your assessment? Does it seem like you’ve paid bribes to Greece to get this Erieye contract? “The radio documentary refers to a period of 15-20 years ago when Ericsson used sales agents to a greater extent than today. In the documentary, it is also mentioned an alleged payment to the President of Costa Rica in 1999. Now, 17 years later, Ericsson has not found any further information on this matter. “Without having received information about which specific ‘middlemen’ it is referred to, we can say that Ericsson, like many other global companies, has used sales agents around the world, which has been a well-established way of doing business in the telecom industry. However, in recent years, Ericsson has phased out the use and today we use sales agents to a significantly lesser extent, for example in markets where it is a legal requirement. Personally, I prefer that openness to the current spin, e.g. “Ericsson disagrees with the claims made in the Swedish media that the company would have used bribes in a deliberate and systematic way” and “we do not agree with the allegations of widespread briberies” (my emphasis in both cases). 2001 – Ericsson was named ‘the sustainability leader in the communications technology industry’ on the Dow Jones Sustainability World Index. The CSR Report covered Environmental, Social and Economic highlights using Global Reporting Initiative (GRI) Guidelines for Sustainability Reporting but made no mention of unlawful activity, fraud, bribery or corruption. 2003 – Still no mention of fraud, bribery or corruption in the CSR Report but the CEO introduction references the Code of Business Ethics and Conduct (complying with laws rules and regulations) and Ericsson’s support for the United Nations Global Compact. 2004 – Code of Business Ethics implemented. 2006 – CSR emphasises a top-level commitment to social responsibility and refers to instructions to report unethical or unlawful conduct, a whistle-blower procedure, and a 2007 objective to have all employees complete anti-corruption e-learning. 2007 – focus on employee anti-corruption awareness with 37,000 completing e-learning; 2008 target is 100%. CSR Report refers to “intolerance to corruption” and an independent verification of Codes of Conduct & Ethics, anti-corruption awareness initiatives and mechanisms to identify, respond, investigate and report incidents. 2010 – Ericsson decides to appoint a Chief Compliance Officer. The Code of Business Ethics is required to be acknowledged by all employees. It also made its first disclosure to the Global Reporting Initiative (GRI); the disclosure makes no mention of anti-corruption. Monitoring and review of the program. 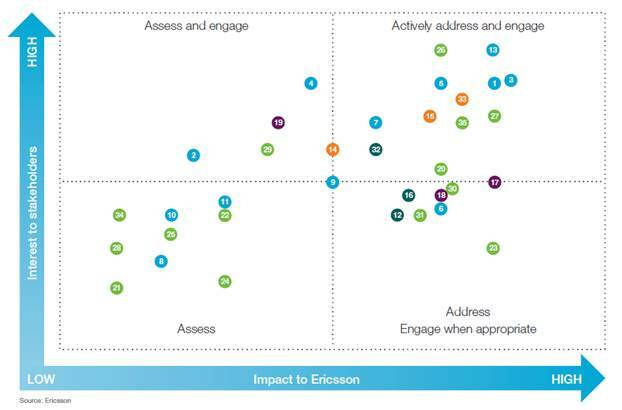 Also, this report sees the first mention of Ericsson’s zero-tolerance to corruption and the expansion of Ericsson’s violation reporting process to include suppliers, customers and other partners. Ericsson joined the Partnering Against Corruption Initiative (PACI), a private-sector initiative to counter bribery from the World Economic Forum. Reported violations increased from 7 in 2011 to 16 in 2012; of the 16 reported incidents, two concerned corruption (bribe-taking). 2013 – CSR stakeholder materiality mapping shows anti-corruption remains a top concern. Updated anti-corruption e-learning taken by 85,000 employees. Business sets a 2014 “Anti-Corruption for Suppliers” training objective. 2014 – Stakeholder materiality mapping shows anti-corruption as the number one concern and the report contains a section headed “Anti-corruption a top priority”. By year-end, more than 90,000 employees had completed anti-corruption training. Percentage and total number of business units analysed for risks related to corruption. Percentage of employees trained in organization’s anti-corruption policies/procedures. 76 violations were reported to the Audit Committee and employment was terminated for six employees in relation to suspected corrupt practices. 2015 – Anti-corruption remains the number one stakeholder concern. It is backed by objectives to increase employee completion of anti-corruption training, target selected suppliers and implement an independent whistle-blower facility. By year-end, more than 94,700 employees had completed anti-corruption training. The GRI Disclosure Anti-corruption section records 116 violations reported to the Audit Committee including four incidents of suspected corrupt practices which resulted in the termination of four employment contracts. It also reports one court case regarding corrupt practices brought against the organisation and an employee. Address the top 80% of supplier spend and mitigate high risks, including anti-corruption. Achieve anti-corruption training for 85% of all employees. Set the tone from the top by including responsible business on main company agendas throughout the year. Implement the anti-corruption screening tool and screen 95% of active and preferred suppliers. By year-end, more than 95,900 employees (84%) had completed anti-corruption training. The GRI Anti-corruption section records 145 violations reported to the Audit Committee; no employment contracts, or contracts with business partners, were terminated due to corruption and there were no corruption related court cases brought against the organization or any employee. Why didn’t your anti-corruption activity start sooner? If you have zero tolerance for corruption, why didn’t you report corruption to the authorities? Is it a legal requirement to use sales agents in South Africa? The Foreign Corrupt Practices Act (FCPA), was signed into law by US President Jimmy Carter in 1977. It criminalises various acts of bribery and related accounting fraud. Ericsson is listed in the USA. Consequently, the relevant US authorities are responsible for deciding whether offences have been committed, who is responsible for them and how they should be prosecuted and/or penalised. Whilst I have referred to allegations against Ericsson, the reality is that bribery, fraud and corruption are acts committed by individuals, not corporations. This concept is borne out by section 9-28.210 of the Principles of Federal Prosecution of Business Organizations, which recognises that a corporation can act only through individuals and that prosecution of a corporation is not a substitute for the prosecution of criminally culpable individuals. It states that provable individual culpability should be pursued, particularly if it relates to high-level corporate officers, even in the face of an offer of a corporate guilty plea or some other disposition of the charges against the corporation, including a deferred prosecution or non-prosecution agreement, or a civil resolution. In February 2016, the Stock Exchange Commission (SEC) announced a global settlement along with the Department of Justice (DoJ) and Dutch regulators under which VimpelCom would pay more than USD795mn to resolve FCPA violations relating to its efforts to win business in Uzbekistan. The SEC said that VimpelCom had paid over USD100mn to an official with significant influence over top leaders of the Uzbek government and the bribes, hidden through sham contracts and charitable contributions, left VimpelCom’s books and records riddled with inaccuracies. There’s no sign of individual accountability in either of those cases, so if Ericsson has breached FCPA, it will be interesting to see whether DoJ brings any corporate officers to account or just writes out another massive bill. Written in 2004, Fleege and Adrian’s paper states that Ericsson’s Code concentrates on the law, saying little about the actual behaviour of employees. 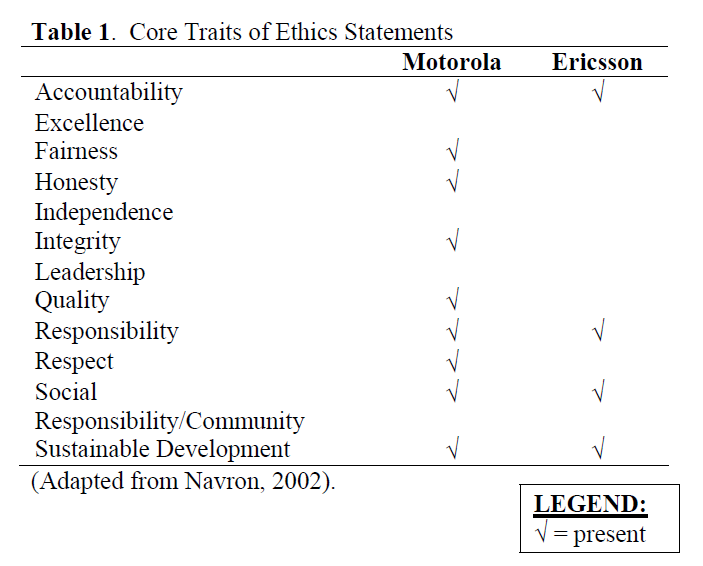 Unlike Motorola, whose Code focuses entirely on respect and integrity, Ericsson concentrates on safety, health, and fair treatment. They also point out that the general management style in Sweden allows employees the freedom to make their own decisions and to solve problems without consulting their superiors. Maybe that was the case in 2004, but I’d be surprised if anyone questioned the need for a formal code of conduct now – should they trust but also verify? Perfect anti-bribery controls don’t exist so no business can guarantee bribery prevention. However, organisations which have put effective procedures in place aren’t going to have to pay a billion dollar fine. Anyway, the true cost is much more than that – employing expert lawyers, accountants, and other advisers to defend the action can equal or exceed the fine. 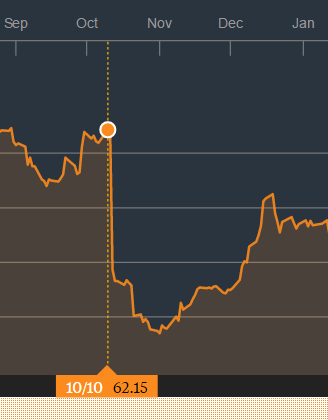 And what about the hit to the share price; what does a 15 percent drop in value do to your cost of borrowing? If you suspect corruption, get specialist advice. Be prepared to hire external advisors if necessary. Subject to that advice, you’ll probably need to investigate the alleged violations to determine scale and scope, and to ensure the violations have come to an end. You’ll have to discipline all parties involved and then remediate processes, including compliance, to prevent further occurrences. And you’ll have to consider reporting the matter to the authorities. In 2016, the DoJ’s Fraud Section was operating a trial which applied credits of up to 50% against the fine sentencing guidelines for 1) Voluntary Self-Disclosure, 2) Full Cooperation, and 3) Timely and Appropriate Remediation. It is necessary to deliver all three to get the full credit. Oscar Wilde said that experience is the name men give to their mistakes – but is this an experience any company can afford?